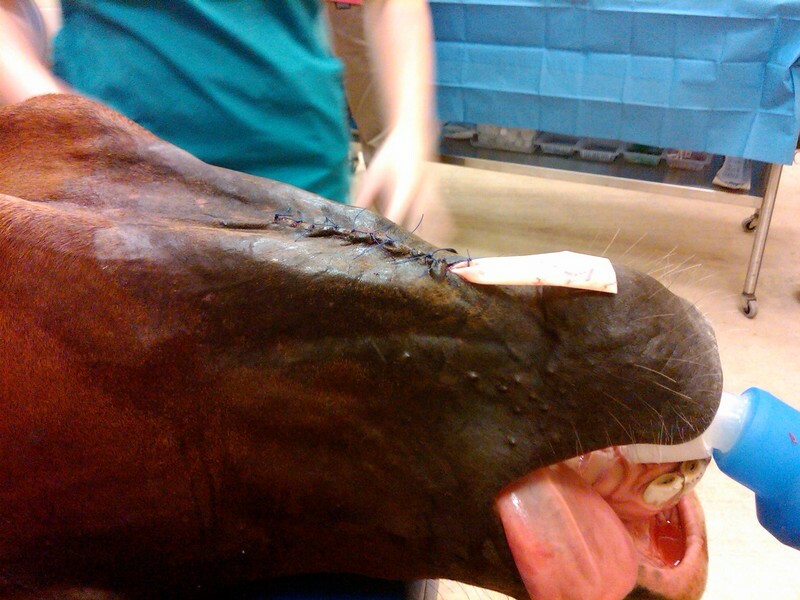 Case History: “June” a 13 year old horse which presented with a golf ball size swelling along the lower jaw. The owner reported that it had been present for approximately 1 year and had progressively gotten bigger over that time. Multiple veterinarians had examined the swelling and determined that it was more than likely a cyst (fluid-filled structure) and that surgical removal should be curative. Physical Examination: On presentation the mass was approximately 2 inches in diameter. It was covered with normal skin and hair (Figure 1). When palpated the mass was firm, but fluid filled. On palpation it appeared to be involved in the underlying musculature. Plan: The mass was suspected to be a glandular cyst or a salivary cyst. Surgical excision was deemed the most appropriate treatment. The horse was placed under general anesthesia and prepped for surgery (Figure 2). Surgery: An elliptical incision was made around the cyst to try to salvage enough skin for closure (Figure 3). Due to the enlarging mass, there was adequate skin for closure. The mass was bluntly dissected free from its attachments (Figure 4). The mass was found to protrude approximately 5 inches into the tissues between the jaw bone and beneath the tongue. Due to the size of the excised mass, there was a fairly large void in the tissue which would need to heal (Figure 5). The mass was examined after removal to make sure it was completely removed (Figures 6a and 6b). A penrose drain was placed to allow excess fluids to escape from the void in the tissues. The subcutaneous tissues and skin were closed primarily with suture (Figure 7). Histopathology/Cytology: The mass was submitted for histological and cytological findings to ensure that the mass was benign. The fluid contained within the cyst was consistent with cystic fluid. The mass tissue itself was consistent with the findings of a glandular cyst. It did appear that the mass was completely excised. Postoperative: The horse recovered well from surgery. The drain was removed 5 days after surgery. The horses was discharged to the owner with instructions to remain on oral antibiotics and anti-inflammatories. The sutures were removed on day 12 with no apparent problems. 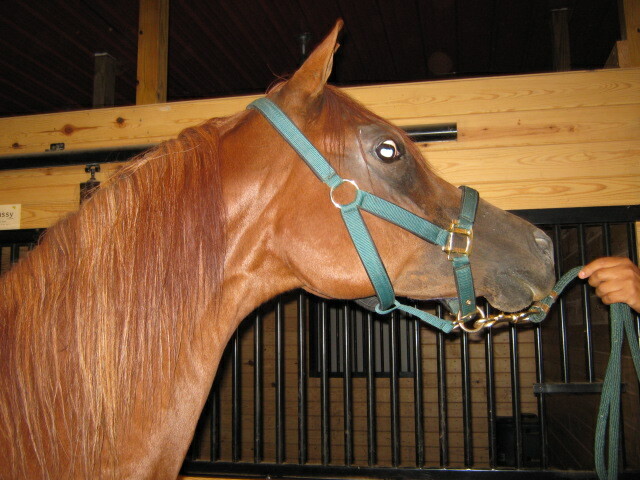 The horse had minimal swelling along the bottom of the jaw (Figure 8).